McCain is hitting Obama hard on taxes in the race’s closing days. FAYETTEVILLE, North Carolina (CNN) - Senator John McCain, campaigning in the must-win states of Pennsylvania and North Carolina, charged Tuesday that Barack Obama has a "creeping" definition of what rich means. 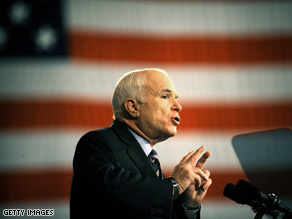 “Senator Obama has made a lot of promises," McCain told a crowd in Hershey, Pennsylvania. "First he said people making less than $250,000 would benefit from his plan. Then this weekend he announced in an ad that if you're a family making less than 200,000 you'll benefit. “But yesterday, right here in Pennsylvania, Senator Biden said tax relief should only go to ‘middle class people - people making under $150,000 dollars a year.’ You getting an idea of what’s on their mind. Eh? A little sneak peek. It's interesting how their definition of rich has a way of creeping down,” said the Republican nominee, to boos from the audience. The Obama campaign said the Illinois senator's tax plan had not changed. “As Obama and Biden have always said, under their plan no family making less than $250,000 will see their taxes increase one cent," said Obama spokesman Tommy Vietor. "And if your family makes less than $200,000 – as 95 percent of workers and their families do – you’ll get a tax cut. Maybe the McCain campaign keeps lying about Obama’s tax plan because with seven days left in this election, voters are rejecting McCain’s plan to give billions more in tax giveaways to big corporations and the wealthiest Americans – but nothing to more than 100 million middle-class families," said Vietor.